We are dedicated to spreading a quality gift of the arts through musical theatre to all of our participants on and off stage as well as to our audiences of all ages. 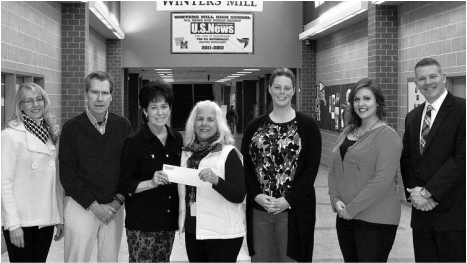 In January 2015, September Song donates $4,000 to the performing arts departments of Winters Mill High School. Pictured from left: Susan Thornton, president of the September Song board; Jack Eichhorn, September Song treasurer; Joan Eichhorn, executive producer of September Song; Caren Bezanson, Winters Mill High school choral director; Kristen Gottleib, Winters Mill instrumental teacher; Meredith Birmingham, Winters Mill drama teacher; and Eric King, Winters Mill principal.